Meet the Bluestream Team in New Orleans from 21st to 24th October. Join Bluestream at the LavaCon Conference, in Portland, Oregon from November 5-8, 2017. LavaCon is a content strategy conference that includes more than 80 sessions and workshops. Bluestream looks forward to meeting up with old colleagues and customers and to making new acquaintances as well. We would love to talk to you at LavaCon. Please come by our table in the Exhibit Hall and tell us about your content challenges! Rik Page is EMEA Director of Sales and Marketing at Bluestream. He has been involved with DITA since 2005, taking part in numerous projects in the UK, Europe and USA. Rik goes out of his way to fully understand the challenges faced by companies and is a champion of innovative technology and clever solutions. You can catch us April 24-26 in San Diego at the Content Management Strategies/DITA North America conference. Please come by our table in the Exhibitor Hall and say hello! We’d love to hear about your content issues. You can hear Bluestream CTO Jim Tivy’s talk, “Addressing localization issues with DITA and a CCMS” on Tuesday, April 25 at 11:20am. Learn more about this year’s conference on the Content Management Strategies website. April 4-6 in Reston, Virginia—Drop by our table and say hello to the Bluestream team at the eighteenth annual Content Management Strategies/DITA North America. We are a community of people who believe that international standards, structured content, reuse capabilities, and multiple media delivery are the directions of the future. Meet publications professionals who have implemented content management strategies and the OASIS DITA standard in their organizations. Hear from key tool developers who are actively supporting the standards-based community. Find out more about the conference at the Content Management Strategies website. June 5-7 in Dublin, Ireland—Join us at the first LavaCon event in Europe, which will be held at the prestigious Trinity College Conference Center near the Temple Bar area of Dublin, Ireland. Learn more about Lavacon 2016 on the conference site. September 12-14 in Santa Fe, NM—Join members of the Bluestream team and CIDM Best Practices for the premier annual conference for managers of information development, training, and support. Learn from your colleagues the best ideas and innovations in the industry. Discover how organizations are pursuing social media, dynamic publishing, content management, enterprise-wide information creation through wikis and blogs, and much more. Interact with a community of peers, all of whom are struggling with many of the same challenges that you are. Share the experiences of managers and organizations that have introduced amazing innovations or seen significant increases in effectiveness and productivity. Find out more about the conference here: link coming soon! Meet us in Las Vegas, October 27-29 at Lavacon US! More information about the conference is coming soon. Lavacon Las Vegas. October 18–21, 2015, we went to New Orleans for Lavacon 2015, “The LavaCon Conference on Content Strategy and User Experience offers expert training on content strategy and how to produce and manage digital publishing projects.” Stop by the Bluestream booth and say hello! April 20-22, 2015, you found us in Chicago, Illinois for the 2015 CMS/DITA North America conference. At this, “the premier content management event of the year,” Bluestream CTO Jim Tivy will be presenting again. This year, Tivy presented on the topic “Release Management with DITA Content.” We invited you to say hello to Jim Tivy following his talk and to stop by the Bluestream booth in the Exhibition Hall. The Fifth Annual Intelligent Content Conference takes place in San Francisco on February 7-8, 2013 at the Mission Bay Conference Center at UCSF. This year’s event focuses on helping organizations better understand the emerging discipline of corporate publishing with an emphasis on teaching you what you need to know about the standards, methods, and tools needed to deliver the right information, to the right people, at the right time, in the right format and language, on the device of the customer’s choosing. Join CIDM April 15-17 at the Rhode Island Convention Center in Providence for the 2013 CMS/DITA North America conference, the premier content management event of the year. You will find exciting presentations in four tracks, including the Emerging Technologies track we inaugurated in 2012. Learn from managers, information architects, technology experts, authors, trainers, and others who have worked hard to develop outstanding solutions for managing content effectively. Learn from their successes and the pitfalls they’ve encountered. Engage in conversations with those who share your concerns, can address your questions, and bring their experience to bear on your plans and hopes. In addition to taking part in the wonderful lineup of more than 70 presentations, visit with the conference exhibitors to learn about their latest product innovations. They offer technologies that help you create content in an XML authoring environment, manage your content store, produce attractive and effective publications, and ensure the quality of what your deliver to customers. Remember, they are anxious to learn about your needs as well. On 13 and 14 June 2013, Utrecht functions as a hub for content and information specialists. Information Energy – Get more out of content! Bluestream was a sponsor at Content Agility 2013, June 26-27, Gatwick (London), UK. 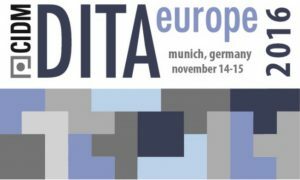 In 2013, we also attended DITA Europe!